ICYMI: Revisiting Haven interviews with cast, crew and writers about season 5B. 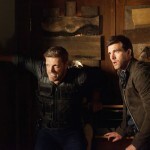 Visit Syfy.com for lots of Haven goodies, including Inside Haven, Haven Origins, Fun Facts, and Guide to the Troubles. Eric Balfour’s Haven media conference was rescheduled. Read his brief Q&A with Buzzfeed on a range of topics. Adam Copeland talks about wrapping Haven and his role on The Flash, airing now on the CW. The TV movie Secret Summer with Lucas Bryant and Emily Rose will premiere December 28 on PixL. It should also be out in 2016 on Hallmark or UP. Uncharted: The Nathan Drake Collection with Emily Rose as Elena was released October 9. All three Uncharted games are remastered in this new release. Hear Emily in the official trailer. Eric Balfour is currently filming the movie Burn Houston. The Girl King starring Lucas Bryant will be released on DVD December 8. Well. Haven returned in the only way it knows how, by blowing our minds. Kudos for this episode are going to Brian Millikin and Nick Parker, who answered questions, raised new ones, and returned Haven to us, even if it is definitely worse for wear. Audrey is back and she’s Audrey. Rejoice! back mean? It’s just Audrey, no other personality, within her. Brian cleared this up on twitter, but so Audrey is immune to the original Troubled people, but she and Charlotte are NOT immune to the Troubles that came out of Duke because Mara messed with those by using aether. The important thing to understand though is that Audrey is back. The Lost Colony. Destroyed folks in NC and now the word is carved in a rock in Haven. That can’t be good. This is a mystery that we only seem to get breadcrumbs too. Hopefully we’ll learn more soon. Game changed when Dwight and Nathan told the HPD about the Troubled. I figured that was as far as things would go. But clearly, that would not be enough. No, the Rulebook for the game was thrown out the window when Dwight told the entire town and single-handedly shutdown HPD and made Guard in charge. Oh Charlotte. What a tangled web we weave. First you’re on Audrey’s good side, because you saved her by giving up your own daughter and now have Audrey as your daughter. But then you go and reveal your selfish nature. Everything Agent Howard told people, who told us, that killing Nathan would end the Troubles was not a lie. It’s not their fault we assumed “end” meant cure, because why assume you mean the literal meaning of a word. Boy was Audrey mad when she heard that from Charlotte. She was so close to losing Nathan how many times and it would have been for naught. I’d be pissed off too. Oh and then for Charlotte’s plan to backfire and now she’s stuck w/her angry daughter and the love of her life you almost killed indirectly. You’re right Nathan. One big happy family. By the way, let’s take a moment to think about this. What was the purpose of letting people know about the killing ends the Troubles thing then? (1) The rings were used to get you through the void without becoming lost. (3) The Colorado Kid killer is back and loose in Haven! Anyone in Haven could be Troubled. Well, that’s not good. Dave will forever be the guy who states the obvious. We still love you Dave. Nathan/Duke – oh how far we’ve come in this relationship. Duke is immune to these Troubles!! So did Joe Sena get a new trouble, like Duke was theorizing b/c I thought he always had the fog trouble, since the last episode, Chemistry (5×13). Gloria can throw tequila back! Officer Brandt is a goober and should have his badge taken away. Town may know about the Troubles, but they don’t know about Audrey’s connection to the Troubles. Oooooh. Duke’s goodbye scene – heart wrenching The guilt he feels. When Audrey holds a grudge….whooo. She holds tight. He’s never heard of Haven….huh. What does this mean for the Troubled folk outside of Haven? Charlotte: “That’s not what I went back for. I needed to get…this. We need these to go home. They pull us through the void. Without them, we’d be lost there. You had Mara’s for all this time, but…never really knew what it meant. Let’s open a thinny, go through the void. You can even bring Nathan. And we’ll return home as mother and daughter. To your real home, with your real family. Audrey: “That’s not possible. You built the barn. It was Mara’s prison, and…it was gonna clean up all of her mess, right? The…the barn was going to cure everyone’s Troubles if I killed Nathan the person that I love. That’s how this was all supposed to work, right? Dwight: “Look around this town. Duke: “So, you guys really think I can just walk through this thing, huh? This entry was posted in Look Back, Season 5 and tagged Tagged: 5x14, look back, New World Order, podcast on Monday, October 12th, 2015 .